This recipe was first posted in the early blog days 5 years ago. It was instantly very popular but also seemed to give some readers problems. I tested it a few times initially, but have now jotted down some notes to make these easy as can be and pretty fail-proof. I was happy to find that the recipe is still solid and really so good. Now I know that churros aren’t Mexican but actually originate from Spain, but in school they used to sell churros in the lunch room on Cinco de Mayo and well- it always seems like an appropriate treat to follow tacos and margaritas. Really though- I don’t need a special reason to enjoy these, I will gladly eat them all year round. The dough used for these is a traditional “choux” dough which is what is normally used for cream puffs and eclairs. It comes together easily and is then piped on a cookie sheet. 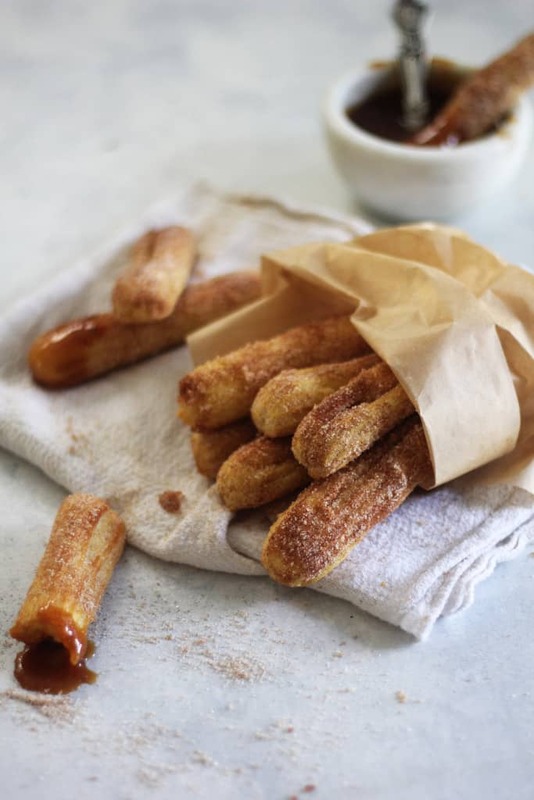 The churros bake up crispy and golden, and then get brushed with butter and rolled in cinnamon sugar. (still better than being deep fried right?) You could also lightly spray them with coconut oil spray, the goal is to allow the cinnamon sugar to stick. Anyway- bake up these easy and delicious treats, and dip them in some chocolate sauce or dulce de leche if you want to get extra festive. (I used salted caramel sauce because I had it on hand. I’ve given some tips and tricks in the recipe for guaranteed success- I hope you make and love them! In a medium saucepan combine the butter, salt and water. Bring to a boil over medium high heat. Remove from heat add the flour and stir to combine. Mixture will thicken and start to resemble the texture of mashed potatoes. Leave dough in the saucepan, but beat it on low with a hand mixer, adding one egg at a time, mixing well before adding another. After adding each egg, the mixture will become wet and glossy, but after mixing on high for a few seconds it will thicken again. Spoon the dough into a pastry bag fitted with a large star tip. Lightly spray a cookie sheet and pipe 6-inch rows of the dough with at least 1 inch between each churro. Bake in the oven for 20-25 minutes or until golden brown and crispy. These baked churros are best enjoyed warm! *There is room for error in terms of the egg volume. Since all eggs are different size, you want to use no more than ⅔ cup of egg total. For me- 3 large eggs yielded this amount perfectly, but I think if you use larger eggs you could end up with watery dough. To be safe measure your eggs and make sure you're not using more than ⅔ cup. what a great idea to bake instead of fry these, audra! I’ve been meaning to try these for a while now, and I love your baked version! Yum! 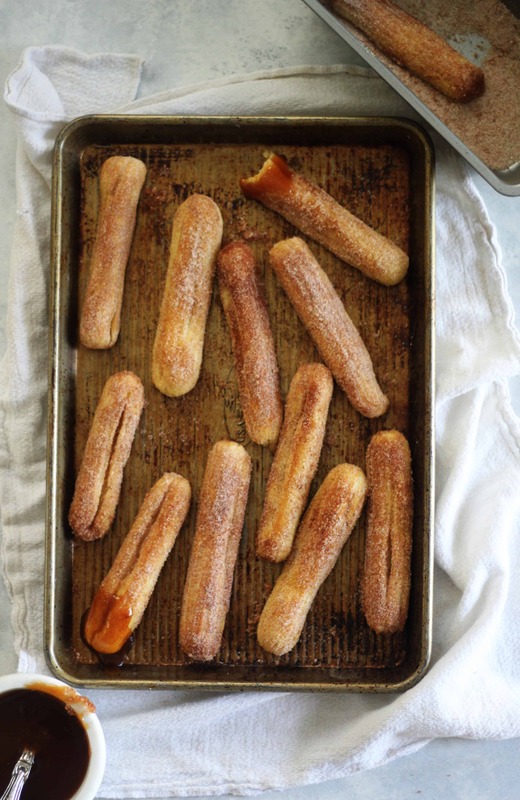 Wow, I had no idea that you could actually bake churros. I hate frying things. Oil scares me, even when it’s in a little saute pan. I stay far faaaar away. But this is an awesome idea! I’ll have to try this some time. I love this, Audra! They look like perfect churros – perfect for Cinco de Mayo! So this is how you make churros! I always wondered how it got its shape!! cool! I can’t have dairy, do you think smart balance would work in place of butter? I have no experience with Smart Balance, but it’s worth a try! If you use it in baking without a problem I don’t think it would be an issue in this recipe. Let me know how it goes! WHAT…!!! Baked churros…!!! Are you kidding me? All in family loves churros, and we used to go a place that make them the best, but I couldn’t eat them because are FRIED and it is too much for me. No, what you are telling me is that I can enjoy a churro, with not guilt…!!! You are the best, you know that…I can’t wait to try this recipe, can I? Love love love!!! I have only ever had them fried. I love this idea. Bookmarking! I am on board with baking churros because 1. they are delicious and 2. I hate frying things! Excellent post! Churros could not be more perfect or more festive. Cinnamon/sugar combo is a weakness of mine and these look fabulous! These are gorgeous!!! And even better that they are baked not fried…mmmmmm. I love that these are baked! Perfect for Cinco de Mayo! WOAH!!! I never thought I could bake a churro. Thank you for showing me this recipe :). I’m totally making it asap! Yay!!! I’ve been wary of churros bc of the frying, and thanks to you now I can have them!!! I’m not sure! As you can see in the picture of the dough on the pan it was very pipe-able. Is there a chance you added too much butter or liquid? I had the same problem and I followed the recipe exactly. I’m really sorry- but I didn’t have that problem. I’m gonna make them again tonight to just double check. I had the same issue. Was very runny, poured through the piping bag. Added 8oz total flour and still wasn’t in a shape to pipe and old a shape. I used a scale to measure and even videotaped it for a podcast. Went back and double checked the video and everything was right on. I measured my king Art flour at 4 1/4 oz per cup. For the life of me I can’t understand why this recipe is so hit or miss for so many people. The only thing I can think if is egg size. Since they tend to vary, and there are three whole eggs in there, I wonder if some very large eggs make the recipe too liquidy. If you make them again, start with two eggs, see if the mixture is pipe-able and if it’s too thick, gradually egg the beaten third egg until it gets to the right consistency. So Sorry! Made this for a simple dessert! It was light and delicious! I substituted the flour for gluten free bisquick since I can’t have flour. I put the cinn sugar on before I baked them. OMG BAKED CHURROS???????? You are so genius. Hi, what tip # did you use? Thanks! Same problem, did you try something different to make it work? I made these again tonight to second check the problem with the consistency. I added some extra notes to my process, but this recipe still worked well for me. I hope it helps! I just made these. The batter was very easy to pipe. They did puff up a bit while baking though, so while you could still see the ridges, mine were not as defined as yours are. Very yummy though!! I am so glad to hear that I’m not the only one who had success with this! Try the Ateco #847 tip if you can or something similar. It’s really perfect! I am so confused as to why this recipe doesn’t work for some people. I have made them 3 times now and they always turn out perfectly. Was the batter thick and creamy like mashed potatoes? I use a soy type of stick butter found in the organic aisle or soy margarine also in stick form. I thing the butter is called earth something. I use smart balance as a spread . but it doesn’t bake well. just like cream puffs! Excellent. I didn’t think about making them in a churro shape. Thank you for the idea. 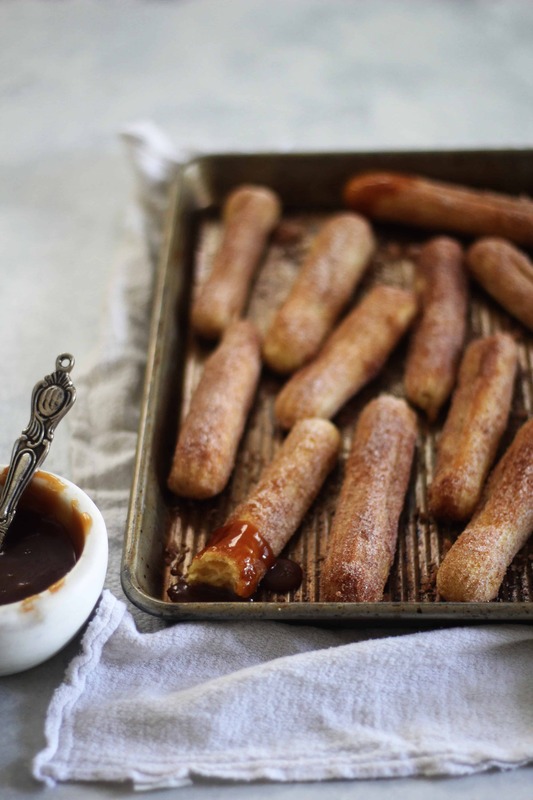 SO happy to find this recipe so I don’t have to figure out baked churros myself :) Making these tonight! Just tried these tonight! YUM! I was able to pipe them just fine. When they were done, they were a little “soft” (like picking them up in the middle would cause them to break in half). Maybe not enough flour? Thanks for the recipe! I’m hosting BUNCO Friday and am having a “fiesta” theme…churros w/vanilla ice cream is dessert! I’d suggest baking a little longer so they are more sturdy! Oh, and should the dough be warm? Or should I let it cool before hand? Maybe this caused my “softness” problem? Hey Amy! I have a few ideas for the softness. 1- I would bake them an extra 5 minutes or so until very golden to help firm them up. The insides should be soft, but the churro should be stiff enough to be picked up easily without breaking. 2- Maybe make them a little shorter? I found that about 6-7 inches was a good length but the longer you make them the more likely they won’t hold together. Oh and I piped them warm- no need to cool the dough! Is that 300 degrees farenheit?? Sorry, im an Aussie!! I just made these! The consistency of my batter turned out just fine, and I’m not always the best baker! I think for the people who’s came out too runny, maybe they let the water/butter/salt mixture boil too little or too long? I made them in mini form! The only problem I really ran into is with the star tip… I can’t find the brand you mentioned, we only have Wilton. So I got the biggest one I could find and that even came out small. Also, when piping, my ends came out ugly because it was a battle trying to cut them off ! Yes 350 degrees F. Sorry I just saw this! I made these and they came out great. So good! The ridges stayed defined about the bake and got nice and crispy in the oven. I dipped them in homemade dulce de leche and made a half batch. The recipe is perfect and I will definately make them again. The recipe worked for me. Hardest part was getting the cinnamon sugar to stick after spraying them. The dough was hard to work with because it was very sticky. My daughter liked them. We will have to try a deep fry too. This recipe took over 30 minutes to bake and I just kept having to check the oven and put them back in.. The middle just would not harden up. I am a bit disappointed. The dough is a little warm yes- no worries! This is a recipe for pate choux (the dough used for eclairs, cream puffs etc), method and all…hence the eclair taste…not sure how authentic they’d be but maybe a good short cut…consistency of the batter may vary due to the.size of everyone’s eggs. It should be easy to pipe and about fall out of your bag when turned right side up. You can.add/take away one or two eggs to help with that. Good idea with the egg size being the problem for some people. I used large eggs and have had great success with this every time! I’ve never actually made pate choux, but that sounds about right. They may not be the most authentic, but they sure are delicious and easy! I’m so glad they worked for you- dulce de leche sounds like a wonderful addition! Sorry you couldn’t find the tip I used- I am going to edit this post and show a picture of the one I used- that should hopefully help! Yes F! Sorry for the late reply! Can’t wait to bake these, look good and easy to cook! They seem pretty healthy too. :) I bet they will taste fantastic. and they don’t need to be deep-fried!! I hope you check out my doughnuts at Leelabean Cakes and try them. They’re the best! Thanks Audra for the inspiration. I’m quite disappointed with this recipe. I’m glad that others tried this and sorta made it work. It smelled great while baking because of the vanilla flavor in it but when I open the oven though, there is this subtle smell of the flour I used (I don’t use the high quality ones. I’m a practical person and those low-grade local branded flour work perfectly for my cupcakes). I took more than 30 minutes to bake, but I stopped baking them instead of waiting for them to turn golden. I used wax paper to line my cookie sheet and it sticked through the paper, then the churro breaks and emits that floury smell. It tasted like flour too, unlike the other churro recipes that I have tried. I loved the consistency of this batter though, sticky but you can control it and can be easily transferred to a piping bag without much of a mess. I made a mix of milk, milk chocolate and dark chocolate dip. Since the churro didn’t work, I just placed the churro in a bowl and drizzled the dip on top. My oven runs a little hot, so yours may have needed a longer baking time. You definitely needed to let them turn golden in order for them to have cooked 100%. If you make them again, let them bake until they are really toasty. That will ensure they are crisp and easy to pick off the cookie sheet. Also- I don’t suggest lining your cookie sheet with wax paper. It typically sticks to everything- so try parchment paper next time! I am literally baking mine now and they are perfect!! Even down to the time it takes to make them is just about right! My husband is going to be so surprised when he comes home and sees I am homemade churros in our one bedroom newlywed apartment! THANK YOU SO MUCH FOR POSTING THIS!! I love them! The Churro’s were great and kids even like them!!! The batter did turn out too runny for me at first, not sure why there’s such a difference in everyone’s but I’m guessing it might be the size of the eggs people are using. (I used what we had, 1 large and 2 jumbo!) But I just added about another 1/2 cup of flour and that did the trick. They took about 35 minutes to get completely golden brown in our oven. I just made these for the second time and they are wonderful. They came out perfect both times! They are a huge hit with my kids and their friends. I wonder if they would be ok with whole wheat flour or a mixture. Then they would truly be a healthy snack. Btw, I serve them with a chocolate dipping sauce that has avocados and bananas in it–yummy and mostly healthy! Thank you so much Danielle for taking the time to let me know how they turned out! I’ve never made them with WW flour, but PLEASE let me know if oyu do! Thank you so much Danielle for taking the time to let me know how they turned out! I’ve never made them with WW flour, but PLEASE let me know if you do! Wouldn’t want to be near your oven at 400 degrees celsius!!!! In the recipe it says ?1/2 tsp Salt……. Is this a type-O? Is it 1/2 tsp salt ? the question mark threw me off…. I just made these, the batter/dough was still really thin so I added in about another 1/8 c of flour. When I pulled them out of the oven they instantly deflated! I covered them in cinnamon sugar..and they tasted really good but just flat! I saw this recipe and thought I’d give them a try since I LOVE churros and baking is a lot healthier than frying.. After making them (which was pretty simple) I just had to try them right away and I have to say I was kind of disappointed.. Not at all what I expected. 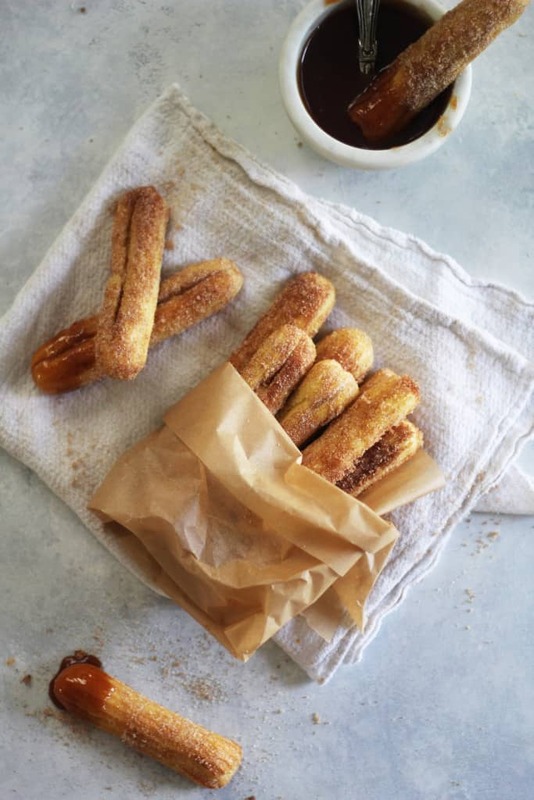 They’re more like a plain ol’ baked pastry with cinnamon and sugar than they are a churro. They still tasted delicious but I think the next time I want churros I’ll stick with the deep fryer :( Thanks for the great recipe though!! help with your family grocery and clothing budget. to get diaper bag including these whistles and bells than buying them separately. Instead of spraying the churros and rolling them in sugar i mixed the sugar cinnamon i(i also added cream cheese fronting) n a bowl with a lil butter and brushed it on them with a cooking brush i also made them much smaller and YUM! Had a bit of an issue with the inside cooking all the way before the outside browned too much, but just took everything and popped it into the microwave for a few minutes and it was perfect. my dough seems watery, is it because it is not thick enough? These churros were AMAZING! I loved that they were baked. I used melted butter instead of the cooking spray and I also made small churro bites using this recipe and they were the best churros I have ever had! I made exactly as in the recipe. They were delicious with the added hot chocolate sauce. Everyone loved them!! I am so happy that I found your recipe as did not want to deep fry them. I love this recipe it’s really easy and always works perfect. Just wondering if it’s possible to make the dough, keep it and bake it a few hours later, a case of limited kitchen space at the venue! Even though I live in New Mexico, I have never tried a churro so I don’t know if these taste like the real deal. But, I do know they are delicious! My kids could not get enough of them! I followed the recipe exactly and had no problem with the dough. I did have to cook about 10 minutes longer than the recipe said, but other than that, it was all the same. Yum! We will make these again! WOW! These were fabulous! I am guilty of subbing the butter for a mix of coconut oil and Melt Buttery Spread (because I can’t eat dairy) and then the cooking spray I have is coconut oil spray and it was DELISH. We made mini ones and we probably made about 30 of them! Mine took around 26 minutes to bake but our oven is coolish so I always plan to bake longer. Hello, I’m just wondering if there’s a difference if the dough is warm, chilled or room temperature when baked. I’m planning to make it for a party, and thinking of making the dough at home and bake it at the venue. Wondering if that’s a bad idea to separate the mixing dough and baking process. I am a professional pastry chef. This is one of those recipes where your own particular climate affects dough consistency. If the dough is too stiff, try adding a little more egg in the final mixing process to bring it to what I like to consider “smooth peanut butter consistency”. I had to alter all my my bread-type recipes when I moved to Phoenix from Miami because the humidity is so different. Hope this helps! I made these today for my gaming group to eat tonight. They are SO GOOD. I needed enough for 6 adults and 4 kids, so I tripled the recipe and it came out PERFECT. I made mine a little shorter in length so the kids couldn’t scatter as much cinnamon/sugar through the house while eating them. Took about 25-30 mins to get golden brown in my gas oven. The first tray I pulled too soon so they were a bit doughy. I had NO issues with the dough. I used my KitchenAid stand mixer to bring it all together. I put the flour in the bowl and then poured in the boiling water/butter/salt mix. Dropped in the eggs one at a time and beat it on medium-high until it made this glorious gooey sticky but oddly NOT sticky dough. I want to make mini ones with a smaller tip some time to see if they come out crunchy. I also want to try spraying the raw dough once its piped out with cooking spray and putting the oven on convection to see if I get a crispier shell. so the eggs don’t scramble in the hot mixture ?? Such an awesome recipe, I have used this recipe many times now & even made them with my 11yr old brother who is just starting to trial baking & cooking and he loved making them & of course eating them afterwards …..we now always double the recipe to make them last longer than a few hours with having 3 boys in the house. Thanks for the ideas. That’s a great cake for my children. Merry Xmas! Hi! Nice looking churros!! Would it be possible to butter for oil in the dough??? If so, in what measure? ?